Known as both a good-time town and a major foodie destination, it’s no surprise that Portland is awash in great options for licking your day-after wounds, with great doughnuts and seemingly better coffee available all over the city. 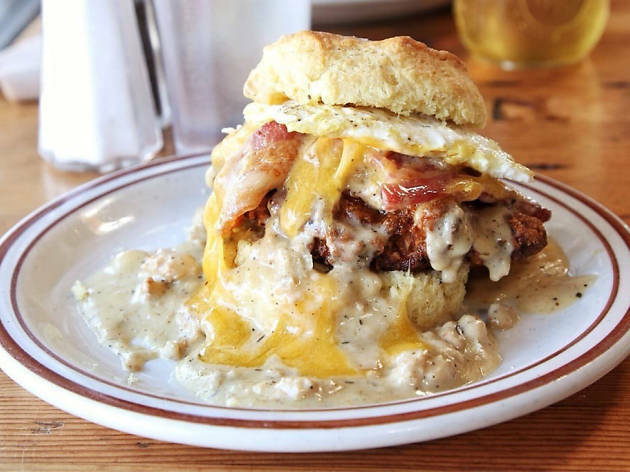 For a more savory cure to what ails you, head to Pine State Biscuits, one of Portland’s most beloved brunch spots, for some exemplary biscuits stuffed with everything from flank steak to pulled pork and sausage gravy. 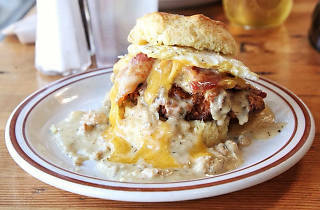 We’re partial to the Reggie Deluxe, a bronzed, flaky specimen split and layered with fried chicken, bacon, cheese and a fried egg, all doused in rich gravy.